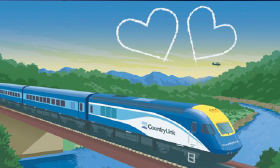 To boost passenger numbers, Valentine’s Day created a great opportunity to come up with Sweetheart Deals. On Valentine’s weekend, couples could make a romantic escape to anywhere in NSW – two for the price of one. Press, direct mail, radio, posters created at Peach. I read this article and found it very interesting, thought it might be something for you. The article is called CountryLinkand is located athttp://www.kbcommunications.com.au/portfolio/countrylink-2/.